There is some debate about the question if the American Visible index typewriter was intended to be a real typewriter or a toy. Considering the fact that the earliest American index was definitely not intended as a toy, we present the later American visible here also. 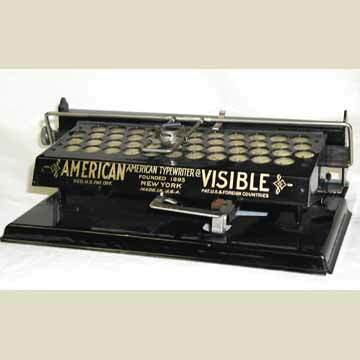 There are clear similarities between the American Visible and the earlier American Index, particularly when you compare the platen and carriage construction. In fact, the American Visible was not a 'visible' writer at all. Printing was done by a rubber strip on the front of the platen, that was hidden from view by the false keyboard plate that served as the index card. The American Visible appeared in several versions that differed primarily in the way the index pointer was designed.